Come along on a rhyming tour through the amazing animal kingdom—from mammals to millipedes and everything in between—with this engaging picture book about how all creatures are connected! There are so many wild and wonderful animals in our world. Some have fur, some have feathers, some have fins, but all are connected. This fact-filled rhyming exploration of the diversity of the animal kingdom celebrates mammals, birds, insects, fish, reptiles, amphibians, and more! It’s a perfect match for budding naturalists and animal enthusiasts everywhere. Diane Lang lives in northern California, where she volunteers at wildlife centers in Walnut Creek and Hayward, and occasionally travels to one in Pasadena, talking with children and adults about our natural world. She especially likes to share the fascinating and wonderful aspects of some of our most overlooked wild neighbors—turkey vultures, snakes, spiders, and more. See some her nature favorites and a few of her poems at DianeLang.net. Stephanie Laberis is a freelance illustrator and character designer for animation. Originally from New England, she now lives in Northern California with her wonderful partner, a couple of felines, and a handful of rodents. Her love for art is rivaled only by her love for animals, and she spends her spare time as a volunteer wildlife rehabber. She loves painting, needle felting, and losing herself in a good video game. The book opens with a big idea: “All animals on Earth are kin, while not the same outside or in.” Various classes of animals are then introduced—birds, amphibians, reptiles, and a few “mixed categories” such as water dweller. Rhyming text is used throughout to define each group and briefly mention its features. For example, the book defines amphibians (“Changing body, smooth, moist skin: that is an amphibian.”) and then shows the process of metamorphosis—a tadpole changing into a toad, salamander, frog, or newt. The colorful illustrations work seamlessly with the text to both reinforce the written information and add additional details. Back matter provides more information about each creature covered and gives additional sources for further investigation. Pair this book with Jonathan Tweet’s Grandmother Fish: A Child’s First Book of Evolution more animal-related science for young learners. VERDICT A clear, inviting introduction to the study of animals. A very good choice for reading aloud and discussing. 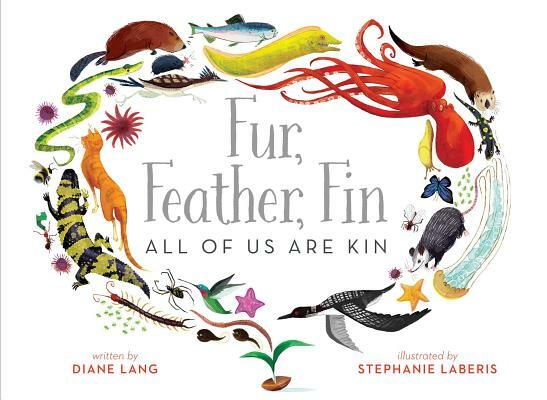 “All animals on Earth are kin,/ while not the same outside or in./ Some we stroke with loving hand;/ some we don’t yet understand,” writes Lang in this uplifting celebration of life that identifies and groups animals according to their taxonomic class. Laberis renders the animal groups in a warm, naturalistic style. One spread features a series of mammal mothers and offspring—a bear and cubs, a cat nursing kittens, and a whale and calf. Other spreads show a small number of animals within their natural habitats, including a spider in its web, a frog and tadpoles in a pond, and an octopus in its den. Lang highlights the biodiversity of her subjects through her vivid verses: “Detrivores, so oft forgotten,/ dine on things both dead and rotten./ Worms and bugs make their dessert of rot into the richest dirt./ Underground or deep in bark…/they’re heroes of the damp and dark.” One spread features a diverse group of human families (“yes, we’re mammals, too!”), emphasizing the interconnectedness of all living things.